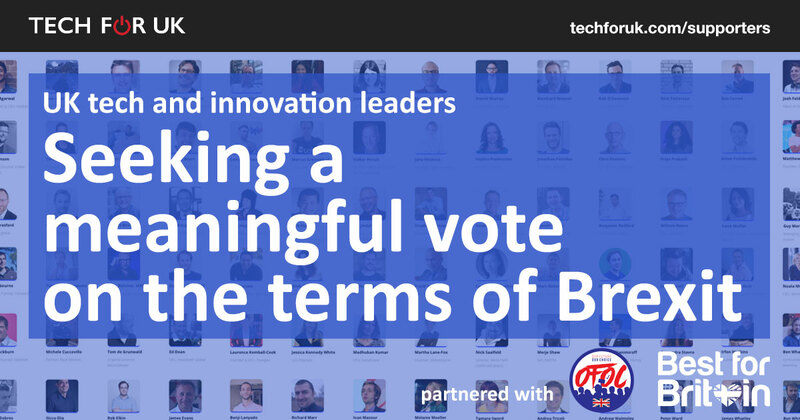 Over 80 UK technology and innovation leaders have signed up as supporters of new tech business group Tech For UK and today called on the Government to back a meaningful vote by the people, on the actual terms of Brexit. said Mike Butcher, co-founder of TechHub, and co-organiser of Tech For UK. Brexit has not happened yet and is already having an effect on the the most innovative part of the UK economy: technology. The Bank of England recently released figures that showed “the UK economy is currently 1% smaller than expected two years ago”. Madhuban Kumar, Founder/CEO, Metafused, and co-organiser of Tech For UK. Funding from the European Investment Fund has collapsed since the Brexit vote, and a replacement scheme has yet to be assured long-term by the government. The European Investment Bank, which backs a majority of the United Kingdom’s VC funds, has slashed deals with UK VCs and private equity groups by more than two-thirds, with no equivalent funding from the UK government in sight. Even a government-backed report cited Brexit as a top challenge for tech companies in the UK. The technology sector has consistently grown faster than the UK economy in recent years, employing over 2 million people and attracting billions in foreign investment. Collectively, Tech For UK supporters have raised hundreds of millions of pounds, put hundreds of millions back into the UK economy and employed thousands of people. This is why Tech For UK is lobbying for this vote. Tech For UK represents the founders of many of the most innovative businesses in the UK including Martha Lane Fox of Lastminute.com and Doteveryone, Ben Whitaker, Founder of Masabi, the UK rail ticketing startup, Bernhard Niesner, founder of the language learning giant Busuu, lending giant Zopa, and George Bevis, founder of small business banking provider Tide, among many others. See what more of our 85 supporters have to say. Tech For UK plans to work closely with Best for Britain, which is campaigning against Brexit and for a meaningful vote on the terms of Brexit which includes an option to Remain and lead in the EU. Tech for UK is a group of concerned tech business people who are calling for a meaningful vote on the terms of Brexit, with the option to Remain and lead in the EU. Tech for UK is a lobby group from the UK technology sector seeking a meaningful public vote on the terms of Brexit that includes an option to remain in the EU.